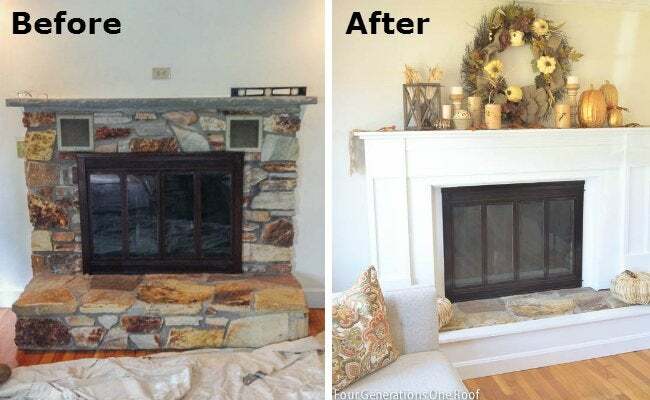 An outdated stone fireplace got a dramatic architectural makeover, thanks to Jessica Bruno of Four Generations One Roof. Jessica Bruno is a mom, daughter, and granddaughter—and the creative force behind the popular blog Four Generations One Roof. Along with her multigenerational family, Bruno lives and creates in the home she grew up in. DIY projects are common here, and the house undergoes frequent change. Since its construction in 1968, the 1,800 square-foot Boston-area Tudor has expanded, through multiple additions, to a whopping 6,000 square feet. 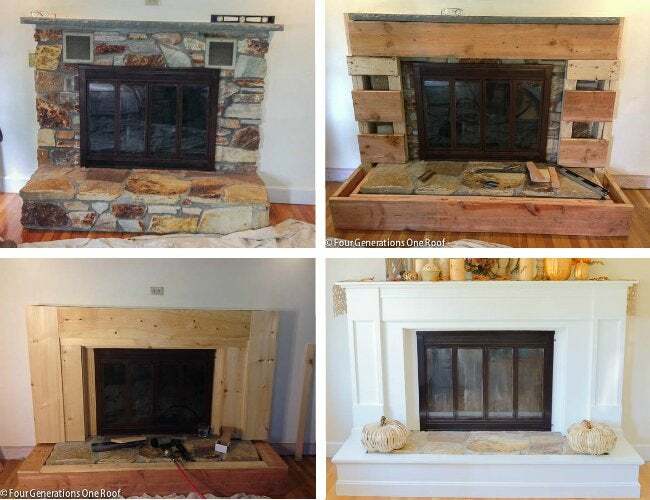 This past year, one project in particular kept her and her father quite busy: It’s a fireplace makeover set to make the space more enjoyable, while also relieving allergies and boosting resale value. Impressed by her success, we asked Jessica to talk about her inspiration and the biggest challenges face along the way. 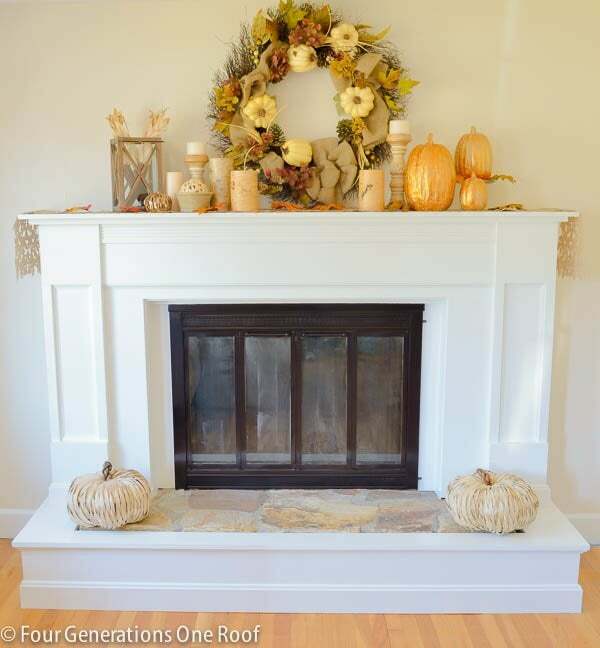 Why were you looking to update your stone fireplace? We have been renovating the house throughout the years, and this fireplace was an eyesore. My mom and I hated the old one. We wanted to create a room that was warm, cozy, and updated. An update would also add value to the home, and that helped push my dad toward joining me. What was your inspiration going into the fireplace redo? A picture I found on Pinterest from Better Homes and Gardens of a beautiful fireplace with a gorgeous white surround and fabulous architectural detail. We always wanted a white wood surround, but we originally intended to leave a little stone showing. When we started building, we didn’t like how that was turning out, so we covered it up almost completely. If we still wanted to use the fireplace, we would’ve had to be careful not to locate the wood surround too close to the hearth. But we actually have plans to add a pellet stove insert. Anyone who wants to cover their own fireplace should check local fire codes. In your design, the wood surround closes off the vents to your fireplace. How do you plan to use it in the future? ​I am actually allergic to the burning wood, so we hadn’t used the stove in years. 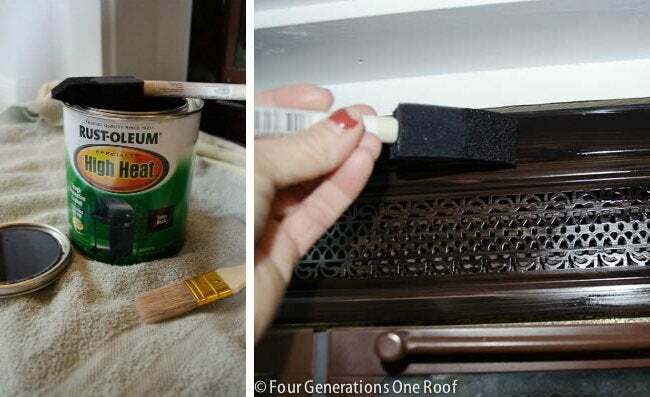 The vents were very ugly, and they didn’t even work—they really served no purpose (must have been the thing to do in the ’70s!—so we covered them up. We plan on adding the pellet insert either this winter or next. That comes as a box to place inside an existing fireplace. A metal, fireproof pipe would run right up the existing chimney. It’s a great idea for homes with old fireplaces that may have a crumbling chimney. And what led to the decision of installing a pellet stove instead? Cost. The pellet stove would pay for itself in the first year, as we would save money not paying for oil. But like I said, we haven’t installed the pellet stove in this fireplace just yet… it’s coming. (It’s a large cost up-front, and while we do most everything ourselves, we’d have to hire a professional for this project.) We did, however, install a pellet stove in the family room! They save so much money on heating bills and are such a cleaner way to heat your home. What advice did you and your dad (your construction partner-in-crime) find to be particularly helpful that you’d share with a reader attempting this? If you plan on using the stove for real, you need to get a permit or check with your local town hall on the guidelines for installing wood near an open flame. Each town has its own set of rules. ​For us, it didn’t matter; we knew we’d never use it, and when we did, it would be with a pellet stove insert. But generally, the wood can’t be right up against the edge. What was the biggest challenge in this project? The challenge was not being able to update the screen doors due to budget constraints. Instead, I painted over the old nasty brass with the appropriate paint. It’s resistant to high heat (it’s actually made to go on the inside of grills). Once the pellet stove insert gets added, it will have new doors. But for now, this is a band-aid solution to make it look better. Is there anything you would have done differently if you did it all again? Saved up money to add new doors—but that’s an improvement that can come later. How does the new design change and improve your day-to-day? ​It’s new, modern, and up-to-date. It changes the entire appearance of the room—and we don’t cringe when we go in there! It’s so nice decorating around it now, and it really feels like the focal point in the room. We love to sit in there and just relax, and we honestly can’t wait to install the pellet insert. Looking at the open flame—without sneezing—will be the icing on the cake.